Sometimes doing laundry turns up the best treasures. We were down at the Plaza “Fluff ‘n Fold” laundromat in Mesa, Arizona, the other day, looking for something to do during the drying cycle. We’d already taken a quick spin through the amazing Superstition Ranch Market next door during the wash cycle. This is a nifty market that sells farm fresh veggies at rock bottom prices we’d discovered last year (while doing laundry!). But now we were casting about for a new diversion until it was time to start folding shirts. Then we noticed some yellow banners flying in front of a building across the street. A small sign said, “Coffee, Bakery, Cafe.” We could swear this hadn’t been here last year, so we headed over to check it out. A cafe that celebrates RVs and RVing! The place is called “RaVeS” with a very big “R” and very big “V” (and big “S”), and when we stepped inside we noticed the whole place was decorated with RV art. The walls were filled with paintings and posters of RVs, and the shelves were loaded with model motorhomes and trailers. This little cafe just opened two weeks ago, and it’s terrific. The muffins are really yummy, and there’s a whole breakfast and lunch menu too. The place is staffed by work-campers who live in the neighboring RV parks, and the patrons are mostly RVers from the area. Have you ever seen an RV-themed cafe before? We sure haven’t! But this little place is in the heart of RV country. Mesa, Arizona, has one of the densest populations of RV parks and RVers we’ve ever seen. A drive down Main Street is a drive through RV heaven, with RV dealerships, repair shops, RV parks and used RV lots lined up cheek-by-jowl for several miles. 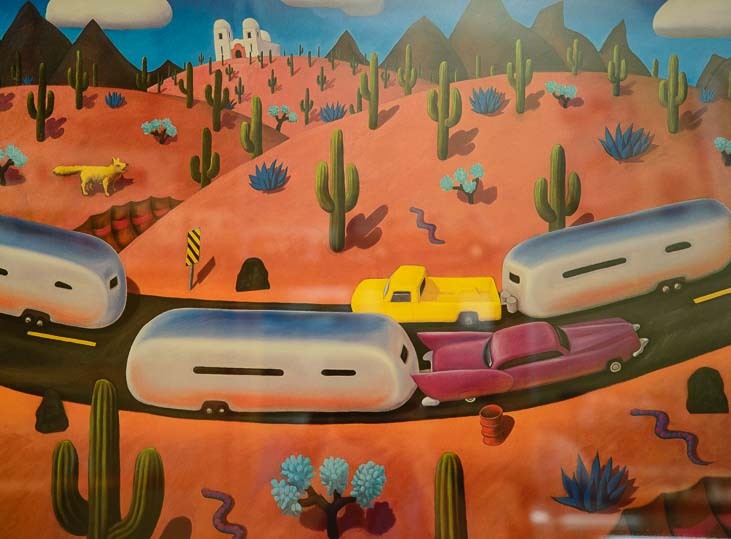 One of many cute paintings of RVs on the walls at RaVeS. 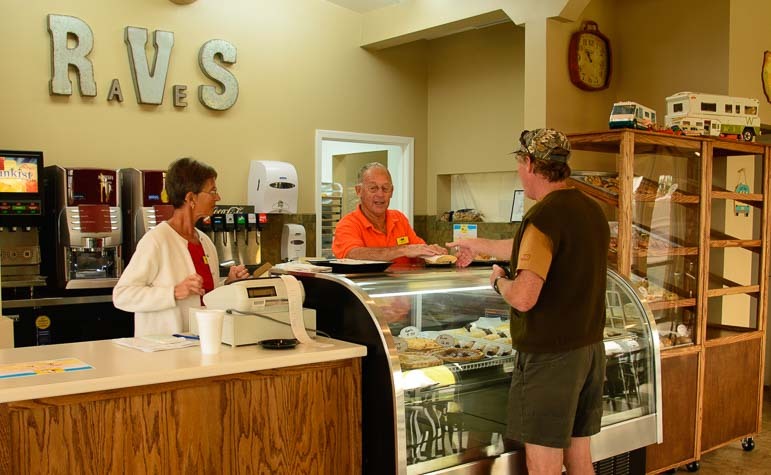 RaVeS Cafe is owned by CalAm Properties, one of the largest privately held owner/operators of manufactured housing communities and RV resorts in the US. They own 12 RV parks in Arizona alone, and seven of those are in Mesa! These are huge communities with thousands of sites in each one. The new RaVeS cafe is housed next to their catering kitchen where they produce meals and snacks to support the many events that are hosted in their various communities. It is walking distance from about 4,000 RV sites!! We’ve been to RaVeS twice now, and each time we’ve met a different couple doing their shift of work-camping. We met Jack and Patti a few days ago, and Harold and Carol were there today. They were putting in one of two days of work they do each week in exchange for their site at a nearby RV park. “We each do 12 hours of work here a week, on Mondays and Tuesdays,” Carol said, “And then we have the rest of the week for hiking.” She grinned. If you are taking your RV anywhere near Mesa, Arizona, this winter, check this place out, especially if you are looking for something to do while you’re waiting for the laundry to finish! The laundromat is at 4815 E Main St. in Mesa, and the cafe is right across the street. This entry was posted in Quick Pics and tagged Arizona, Arizona Central, Quick Pics Arizona Phoenix East by Roads Less Traveled. Bookmark the permalink.